Tracking and monitoring data is one thing. Using the data to drive your decisions about how to train and race is a different story. Knowing how to filter and decipher all the information that you have can be difficult and confusing. Training Peaks is the best tool to use for any triathlete using a data-driven training approach, and today we'll cover how to use it effectively. CLICK HERE to get access to a video where I show you exactly what I include in my dashboard and exactly how to set it up in Training Peaks. It is both for athletes who are self-coached and for athletes who are working with a coach. For athletes: You have free and premium accounts. The free athlete account has all the basic functionalities. You can log your training on the web or mobile apps. You can upload workouts from all multi-sport watches which can be synched with Training Peaks in some way, so it's easy to upload and log that training, and get the basic workout and fitness summaries. It's good basic data and analytics but you're not getting all of it. You can also use a basic account to work with a coach or to buy a training plan on Training Peaks that are created by different coaches. Any coach can upload a training plan in Training Peaks and sell it there. You can also track your equipment usage - how many kilometers have you been running on certain pair of shoes for example which can be useful. For a premium account you can do all that but you can also get much more advanced metrics and data and for many of the topics that we'll cover in today's episode, the premium account is necessary. You can periodize your training plan. First of all, you can create workouts for the future which you can't do on a basic account. To clarify, on a basic account you can't schedule a track workout for next Wednesday that you will see in your calendar view. You can only log workouts and see retrospectively what you have been doing, but you can't plan ahead within the platform itself. But that's what you can do with the premium account and you can periodize your training based on training stress score. You can build your own workout libraries and use unlimited workout libraries. You can sync Training Peaks with your calendar. I for example, sync Training Peaks with my Google Calendar so I can see right in Google Calendar what workout I have scheduled. You can get all sorts of metrics not only for the workouts but within intervals in the individual workouts - very advanced analytics. You can have all the fitness trends, charts, and everything that you could wish for to analyze your training and drive training decisions. You can use the Performance Management Chart (PMC). And finally you can use elevation correction which is not available in the basic account. Training Peaks is a browser-based software but it also has mobile apps for both iOS and Android so that you can look at your calendar and see your scheduled workouts on the go. The only downside is that the app doesn't save your calendar locally, so you need a network connection which can be a bit of a problem sometimes if you're abroad for example and you don't want to use mobile data. But other than that the software and the mobile apps are excellent products. The cost is $19.95 for an athlete premium account if you pay monthly. But you can sign up for longer and you get a very significant discount. They have quarterly, semiannual, and annual subscriptions as well. For the annual subscription it's $119, so that would be ten dollars less per month compared to the monthly price of $19.95. I would recommend starting with one month only, and see if you want to use it (which I recommend, but I realize as well that it's not for everybody). For those who don't want to do this themselves maybe a coach is a better option. But if you want to do it yourself then definitely go for that annual subscription to save ten dollars per month. The important thing elements of Training Peaks is your calendar tab, where you can see past and future planned workouts. Then you have a dashboard tab where you can add different charts to monitor your training progress and track trends over time. And then you have an Annual Training Plan tab where you can create a road map of your upcoming season based on training stress, which is neither duration per week nor intensity, but the combination of the two: training stress score. That is a very important metric. You also have a Home tab which shows your upcoming events, your goals, the training that you have scheduled for today and so on. If you have a coach, you can use Training Peaks together with them. In this case, your Training Peaks account is synced to your coach's account and your calendar will be populated with the workouts that your coach creates and schedules for you. Once you upload the workouts that you've completed, your coach can see all the details and analyze them. You and your coach can comment on the workouts. Your coach can see all your fitness trends. They can set up their own preferred dashboard for you. It doesn't change the way that your dashboard looks like as they are independent of each other. That way you can both look at it the way you would like to. About syncing, as I said it syncs with all sorts of multi-sport watches. For me, I have a Garmin Forerunner 920 XT that I can use to upload my workouts to Garmin Connect using Wi-Fi or Bluetooth connection. So when I get to a known Wi-Fi network it automatically uploads my latest workouts that I haven't uploaded yet or I can upload to my Garmin Connect on my phone over Bluetooth. Training Peaks automatically pulls the workouts from Garmin Connect. 1. Your functional threshold and training zones need to be set correctly. We talked about this in episodes 27, 29 and 30 on training zones. Based on your fitness assessments (field tests) or on different races that you do, you can set your training zones, and keep them up to date. All the important metrics and data that you get from Training Peaks rely on you having your functional threshold powers and paces in swimming, biking, and running set correctly. If they're not correct then you will make incorrect decisions when you try to base decisions on the data that you receive. You don't need to test too often. When you're in the racing season you can use race results to update your functional thresholds if needed, or when you get some experience you can just base it on feel and do slight adjustments whenever needed. But of course, a fitness assessment like a 20-minute test on the bike for example is also a great workout, so there's no harm done testing pretty often if you if you're not getting stressed out about that. 2. Plan, assess, and periodize your training using Training Stress Score (TSS). Training Stress Score (TSS) is a metric that takes both intensity and duration into account so that you actually get an accurate view of your workload. If you're saying that you're training 15 hours per week, that doesn't really tell you that much at all. What if those 15 hours are all very easy Zone 1 types of training? That's one thing. But if you have a lot of high intensity training in there, then that 15 hours is a lot. So TSS combines the intensity, which is based on your functional thresholds, with the duration that you spend at different intensities (training zones or more accurately, percentages of functional threshold). This means it calculates very accurately the workload for each workout so that you can compare long and slow workouts with short but intense workouts and get an accurate view of how big a workload each workout imposes. You can use Training Peaks to create an annual training plan where you base that workload per week on TSS instead of what has traditionally been the way that athletes have periodized their training: based on duration. Instead of just putting in the hours that you will spend the training each week, you will put in the TSS so that when you move from a phase to another, for example where the distribution of intensity might change a lot - your workload is still consistent with what you've been doing before. If you suddenly increase intensity and also slightly increase duration, then that is a huge increase in workload. But when you’re periodizing with TSS you can make sure that that workload might increase a bit but not too much. While it's a great feature, it’s not necessary to create an ATP and periodize based on TSS. I don't do it for all athletes. I do it for some, athletes and I keep track of it, but it's not the most important feature in Training Peaks in my opinion. 3. Use the Performance Management Chart (PMC) to monitor fitness fatigue and form. Fitness in Training Peaks is Chronic Training Load (CTL) which is the average TSS per day that you have sustained over the last six weeks. So, the higher the average the fitter you are. But that doesn't mean that the athlete with the highest CTL wins the race, because CTL is individual for you. But if your CTL is increasing then you are getting fitter. Fatigue is Acute Training Load (ATL). This is the same as CTL, but instead of a 6-week average it's a 7-day average. So it's the very recent training you've done. For example, if you've been to a training camp your ATL will be very high and you'll see a big increase in fatigue. In contrast, if you had a rest week then you should see that your ATL is very low, comparatively speaking, because you have done much easier training over the last 7 days. Form or Training Stress Balance (TSB) is the difference between fitness and fatigue. Let's say your average TSS over the last six weeks has been 60 and you have recently been to a training camp so that your last week was an average training load of 100 TSS per day. Your TSB would then be 60 minus 100 which would be -40. So you would have a very low TSB which indicates that you are not in form to race well due to your training heavily at the moment. You're not fresh. But then again, when you taper for a race and your training is getting lighter and lighter and you decrease the duration of workouts your ATL will be much lower than your CTL. So TSB will be positive. A good training stress balance range to shoot for is -10 to -30 when you're in training mode. Then there's a transition phase which is sort of a gray zone which you want to mostly avoid. You will mostly spend time in it when you're transitioning from the training phase to peaking phase. It ranges between -10 and +5. And then on race day, you want that training stress balance to be in the +5 to +20 or even 25 range, depending on your goal race. The longer the race the higher the TSB you'll want on race day. So a higher positive maybe a +20 or even +25 for an Ironman. But for an Olympic Distance or a sprint distance, +10 might be a good value to shoot for. There's a lot that goes into the PMC but the bottom line is that the during your training and up until your taper you want to see a general trend of increasing fitness and in this period your form can and should be below and your fatigue can be high. You should take rest days and easy weeks to somewhat reset that balance regularly. Once you start peaking for a race you want to decrease your training load so that your fitness decrease is fairly small, but you're form increases a lot. This means that you're ready to race. To learn more, check out Episode 7 - How to use data to get faster with Jim Vance who is the author of Triathlon 2.0 which goes into much more detail on all of these topics. Or read this in-depth article I wrote on the topic of Data-driven triathlon training. Your ramp rate is how fast your CTL is increasing. Obviously, it's nice to see an increase in fitness but if it happens too fast then you run the risk of becoming overtrained or getting injuries and illness. 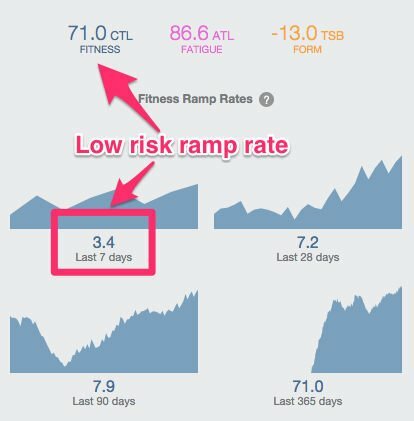 So Training Peaks automatically displays the fitness ramp rates - how much the CTL has increased over the last 7 days, 28 days, and 90 days. Perhaps the most important one you have a look at is the last 7 days. There are some guidelines for what range is acceptable for different types of athletes. Let's say that you are on the lower end of how much you train, so your CTL is 45 or less. Then a lower risk is ramp rate would be 4 or less, so 4 points increases in CTL over seven days. A moderate risk could be between 4 and 6 over 7 days. And a high risk would be 8 or more. If you're on the higher end of the fitness scale, so you have a CTL that is 70 or more, then these numbers are slightly different. A high risk ramp rate would be a CTL increase over 7 days of 10 or more. ​There are two great metrics that Training Peaks provides for doing this. Your aerobic endurance is essentially your engine or your base fitness. They are called decoupling and efficiency factor (EF). Decoupling refers to the drift in heart rate that you may see if your base is not good enough for a constant output. So if you're running it would be a constant pace assuming that the ground is flat. Training Peaks actually normalizes your pace so that it takes into account hills and elevation changes - it's called normalized grade pace. You’ll obviously get your overall pace as well the way that you're used to but in this decoupling metric if you see for example you have an absolutely constant pace but your heart rate increases from a stable level by 5% then you would have a decoupling that is 5%. And that 5% is considered the borderline where you have a good base but if you go any higher than 5% you still have work to do on it, and if you get further below 5% then that usually indicates that you don't need to do too much more work on your base fitness, just maintaining it and then switching your attention to other aspects of your fitness. So that 5% is a great guideline for when it's time to switch from the base phase of training to the build phase if you're doing a traditional linear periodization model. The efficiency factor (EF) measures how long you can go per heartbeat, or your distance per per heartbeat. This is individual, so you can't compare efficiency factors between athletes. Two equally fit athletes may have very different heart rates at the same relative intensity just because they have different maximum heart rates. But that doesn't mean that there's any difference in their fitness. One runner may be running at 130 beats per minute whereas the other is at 150 and it's an equally easy intensity for them and the exact same pace. But you can compare yourself if you do some workouts that are consistent from time to time and see how your efficiency factor develops over that same similar workout in similar conditions with similar preparation. Again, this is something that you can use to see whether your aerobic fitness is still improving, if it is then you would do well to continue building that base. But if it's flatting out then either you’re training incorrectly, or if you feel that you're getting to a good base fitness then probably you have reached the level that you can reach in this training cycle for the base fitness - the aerobic engine - and should again move to the next phase of your training periodization. ​Muscular endurance in simple terms is your ability to push moderately-high to high intensities over an extended duration. It would be Zones 3 to 4 as per the training zones systems we covered episodes 27, 29, and 30. And your muscular endurance, especially as you get a bit faster and have been in the sport for a while, is probably the most important determinant of your physiological fitness as a triathlete and how fast you can go. So, during the periods of the season for example, build phase and leading up to races, when your goal is to increase muscular endurance, you should be keeping an eye on how your muscular endurance develops. And my favorite metrics for this are P20 and P60 for the bike, which is your peak power output over 20 minutes and 60 minutes respectively. It’s the best average power that you have held in a training session or race for 20 minutes and 60 minutes on the bike. Likewise for running you have the P20 and P60 but they would correspond to pace in that case and not to power. The best average pace that you've held for 20 minutes or 60 minutes on the run. And what you want to see is a nice, steady increase in P20 and P60 as you progress through your training phase where you're working on muscular endurance. If you're not, then you are probably doing something wrong in your training, because it should be improving. You should be doing the type of training that allows you to see those improvements as well. There are guideline ranges for what TSB to aim for when designing your taper but there's still some individual variance, so you'll get better and better at finding the right TSB with time. Some athletes may perform very well at a TSB of +5 which is a very low positive training stress balance. More often than not these are very fit athletes, so if you're less fit then maybe err on the side of having a higher training stress balance. Something like 15 to 20 or even 25 if it's an Ironman race, for example. I recommend shooting for the range between +5 to +25, and I would reserve those 20-25 for Ironman races. For a half, maybe you can go there too, you'll need to try it out. But otherwise, 10 to 20 is a great range for an Olympic distance goal race or a half distance goal race. You can define your taper down to that single number and you would do that based on how you have performed in previous races. Go back and have a look at what your TSB was on race day when you performed your best, and what has it been when you didn't perform well. Think about what you felt in that race as well. Did it feel like you were overly fatigued? Because in that case you probably had too low a TSB and didn't come into the race with enough form. You weren't fresh enough. When you plan your training sessions in Training Peaks, you can assign intensity estimates to future workouts and what duration they are, and Training Peaks will calculate the TSS that you will get from that workout. So you can see from a very long time out (if you have all your training sessions planned) what your TSB will be on race day if you do the training sessions in that exact way. And even if you just estimate, which is what I would recommend, you can get very close to reality, and that is what I do for the athletes that I coach. This is definitely one of the best functionalities that you have in Training Peaks in my opinion. One important point that I want to make is that you don't want to lose too much fitness (CTL), because then that will also be detrimental to your race performance or you won't perform as well as you could have. Usually, a rough guideline again would be to lose at most up to 10% of your peak CTL for an Ironman goal race, and maybe for a half distance close to 10%, but for an Olympic Distance goal race probably closer to 5% or so. 8. Reverse engineer your key workouts. To reverse engineer your key workouts, you need to know your functional thresholds especially on the bike but also on the run. Then you need to know your target race intensity as a power number or a percentage of your functional threshold. Also your goal time for the bike leg of your race and that needs to be realistic based on that target power number or percentage of FTP. So you need to have some idea, and if you don't you need to figure it out. There are online calculators but they are not very exact. I would recommend you try and go out in similar conditions on a similar bike course to your target race, and hold that power number to see what your average pace is and that way you can calculate what your time will be if you hold that power output for the entire duration of that bike leg. So for example, if you're planning to do an Ironman race and you have an FTP that is 250 Watts and you want to ride at 70% of FTP, which is 175 watts. Then you can have a look at what average speeds that you've been holding for training rides at that power. Let's just say for argument's sake that you averaged 31 kilometers an hour at 175 watts. When you divide that 180 kilometers with 31 km/h you get a time estimate of power 5 hours 49 minutes. So that would be the duration that you're out for and holding that 175 watts on your race day. Then you can calculate your training stress score based on those numbers. So, 5 hours 49 minutes is equal to 5.8 hours, and you multiply that by your intensity squared. And your intensity is 70%, so you take 0.7 squared. Then you multiply that by 100. This will give you a TSS of 284 which is, now that I look at my reference table from Triathlon 2.0, very high. The recommendations here is if just want to finish, shoot for a bike TSS of 220 to 260. If you're a mid-packer then 240 to 270 is appropriate. And if you're a very competitive age-grouper, go for 270 to 290. But for argument's sake, the thing that you can do with this number - your estimated TSS on race day 284 - is to do workouts where you accumulate that amount of training stress score. Not all of it will be at race intensity. There will be segments that are a lot slower but then there will be race intensity segments in it, and pretty long ones as well. So this will be a very hard, big day out, and this will give you an idea if it's realistic and especially once you add that brick run. It's important to add that brick run on top of that big ride, but it doesn't have to be too long. 30 minutes is plenty, but you need to see that you can run at your planned target race intensity or race pace after doing a ride of this amount of TSS. That will give you a great idea of whether you're on track or not, or if you should adjust your targets or your expectations. Imagine how important it is if you can find this out in training that something is definitely realistic or not realistic and you don't need to find out on race day. 9. Comparing key performance indicators in season and season to season. ​Training Peaks has so many great charts that are so easy to use - drag and drop and build to your heart's content so that you can compare different metrics. For example you can have overlaid graphs that show how a certain metric has evolved comparing two different time periods. It can be comparing this season and last season for example, or it can be the last two months and the two months before that, to see whether you're developing in this current season. Important examples worth mentioning is just comparing within seasons for the last couple of months compared to the previous two months those muscular endurance metrics that I just mentioned: P20 and P60 on the bike and the run. 10. What data and which metrics should you focus on? The PMC incorporates all of those and is a great visual chart so that is the most important one in my opinion. And then we have the training stress score (TSS). As I mentioned, it's the key to all of this. Nothing would be possible without training stress score. But it's not too often that you need to actually be so concerned about planning training stress scores for workouts. Although you can do that and I think it's probably good to do that as well, it’s something that I usually do mostly in the peak/taper period, and not that much outside of it. At other points of the season, at least I use it more as a retrospective metric. In the taper period it becomes very critical to be mindful of planning according to TSS. Of course, for some athletes, if you periodize with TSS it's critical throughout the season. Other metrics to follow closely are those decoupling and efficiency factor metrics for aerobic endurance and P20 and P60 on the bike and run for your muscular endurance. ​Finally one thing that I should mention is that I created a video on how to set up your dashboard in Training Peaks. You can see exactly what charts and graphs I use in Training Peaks and I will give you an idea of exactly what you can do in there and how it may benefit you. In-depth article on "﻿﻿﻿Data﻿﻿-driven triathlon training"
Episode 7 - How to use data to get faster with Jim Vance who is the author of Triathlon 2.
thanks for another great episode. I was just wondering about the synchronization with Garmin. I have the 735xt which I think is quite similar to yours. Do you have any tips on how to synchronize the planned exercises in Trainingpeaks so that they appear in Garmin Connect? Right now, I have to manually export each exercise in Trainingpeaks and transfer it to my watch via USB which is quite cumbersome.